after a speech on Saturday, Jan. 5, 2013, at an Idle No More rally in Portland." It's an interesting place because the natives of Maine have not been driven off all of their ancestral territories; the Penobscot Nation continues to operate its own government and exercise its sovereign rights on the very doorstep of Bangor and along the Penobscot River, keeping its culture and language alive since prehistorical times. Penobscot, Passamoquoddy, Mi'kmaq and Maliseet nations make up the Wabanaki Confederacy which continues to educate the rest of us about proper relations to the Earth and other sentient beings. The Confederation helped make history by winning a land reacquisition and reparations lawsuit in 1980, after which some of their (heavily clear cut and polluted) territories in Maine were returned to them. Further, Penobscot leader Maulian Smith has been in international news repeatedly as a spokesperson for the ongoing campaign to retire the racist high school mascot -- the Skowhegan "Indian" -- sole remaining mascot based on native people among our state's high school sports teams. I will not be attending because I am a mother and my life is not my own, if I did not have kids I would be more willing to put myself at risk. When you have dark skin you are in danger at trump rallies, that is the America we live in right now. So when a comedian led off yesterday's rally in Bangor with an indigenous-themed insult aimed at a senator from nearby Massachusetts (a state of which Maine was once a part), it resonated deeply. Because the senator claimed native ancestry based on family lore, right-wingers have dubbed her "Pocahontas" or in some cases "Fauxcahontas" ever since. Every rally needs a good opening joke and apparently this was considered such by the white people assembled as they responded with glee and a chorus of faux "Indian war whoops" when the comedian mentioned the senator by name. When the demagogue with the bad hair took the podium he followed up by actually saying "Pocahontas" which further delighted the crowd. The historical truth about a Powhatan woman nicknamed Pocahontas can easily be discovered, if one were inclined toward education. The Powhatan people were living in the area now known as Virginia when English settlers disrupted their way of life and kidnapped a woman whose actual name was Matoaka. Of course the P-word as used by racist demagogues references not the actual history but only the Disney movie which appropriated this unfortunate woman's nickname and promoted a lie told about her by the Englishman John Smith. There's a video going around with some supporters of the presumed Republican nominee making claims such as: "It's not about race. You people just make it about race because you're trying to be politically correct." The p.c. meme is a talking point drummed into listeners of right-wing hate radio and it crops up constantly in online comments that are, um, racist. But it is about racism. 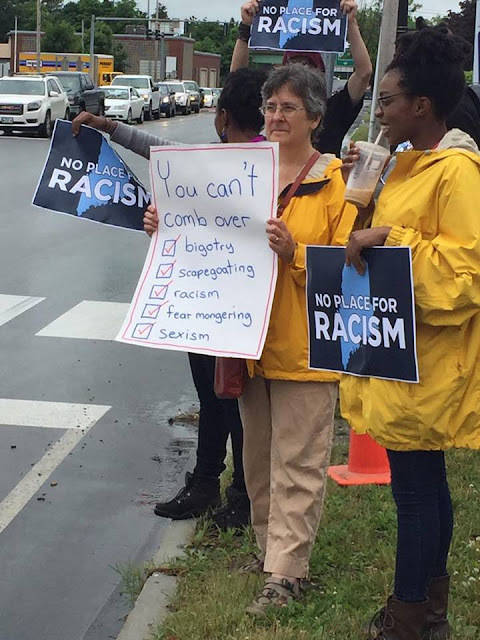 As a woman born in Bangor and a long time Maine resident, it chills my soul to witness the outpouring of racism which I knew was here all along but which people used to hide from public view. Now, they display it proudly. It makes Maulian and her daughters and lots of other people in Maine much less safe, psychologically and physically. It makes me sick. One last facebook post from the demagogue's last appearance in our state, in Portland. I heartily endorse this message! So far, I've seen no "Skowhegan Indians" coming to the defense against Sweep Hair's racist remarks about the Dawn People. 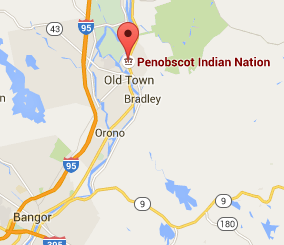 I guess the "Skowhegan Indians" really are not so proud of Native-American heritage as they say they are.